Did you know bowling dates clear back to the Egyptians in 5200 BC? It's true, although some argue that it really originated in Germany in 300 AD. Either way, that was a really long time ago. Back then they rolled cannon balls to knock down objects called pins, and it was called "Kegelspiel". Now that's funny! It wasn't until the 1800s that it made its way to America. Now it is known as a competitive sport. And who would've thought it takes 135 muscles to play. 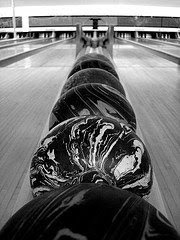 The sport of ten-pin bowling is performed on a straight, narrow surface known as a lane. This bowling lane is 60 feet from the foul line to the head pin (1-pin). About 15 feet from the foul line are a set of guide arrows. The lane is 41.5 inches wide and normally consists of 39 wooden boards or a synthetic material. As technology has improved, the game has only grown bigger and better throughout the years. Without those nifty screens and computes scoring can be quite complicated. Wikipedia has done a great job at explaining it. And for more fun facts visit this site.